Here are some items of import related to genetics and pharmacogenetics from a wide range of sources. An article on precision medicine from Scientific American examines some very important questions surrounding precision medicine and the collection of genetic data from groups of people who may not fully understand what they’re trading away when they sell their genetic information for a mere pittance. Kannapolis, North Carolina, is a desolate town, plagued by unemployment since the main employer, a textile mill, suddenly closed its doors eleven years ago. In the aftermath of this shutdown, an elderly billionaire, David Murdock, who is curious about longevity and its genetic secrets, turned an enormous piece of land into a lucrative biotech complex. To the Kannapolites, Murdock offered a deal: let me extract your DNA for research on personalized diagnostics and treatments and you will get a $10 Walmart gift card. Many residents took the deal, and handed over their biological materials for an unlimited time.Without the resources to pay for the expensive treatments and cutting-edge medicine that could come from their genetic material, ordinary residents of the town are unlikely ever to reap the benefits of supplying their blood, urine and personal information. 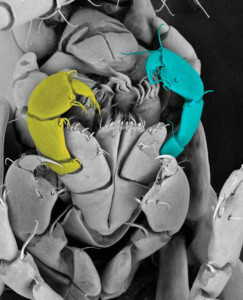 Scientists use CRISPR to genetically alter this amphipod’s normal mouthpart ( shown in yellow) with a claw ( shown in blue). You can read further about this genetic editing study in further detail here ( Study Summary Free-Full Study Requires payment). Human Gene Editing: Where Do We Draw The Line? Advancements in our ability to alter the human genome and genetics have sparked intense debate over ‘designer babies’ and health ethics related to genetic editing and technology. Renowned scientists, ethicists, and quite a few reporters, met in Washington DC earlier this month for an international conference to discuss the hot topic of human gene editing. Remarkable new techniques now allow precise insertion, deletion or alteration of DNA sequences, more often than not using the CRISPR-Cas9 system – covered in our blog earlier this year. The Latest improvements allow scientists to make genetic modifications much more easily and accurately than ever before, but with these incredible advances come big questions regarding the ethics of using such a powerful tool.